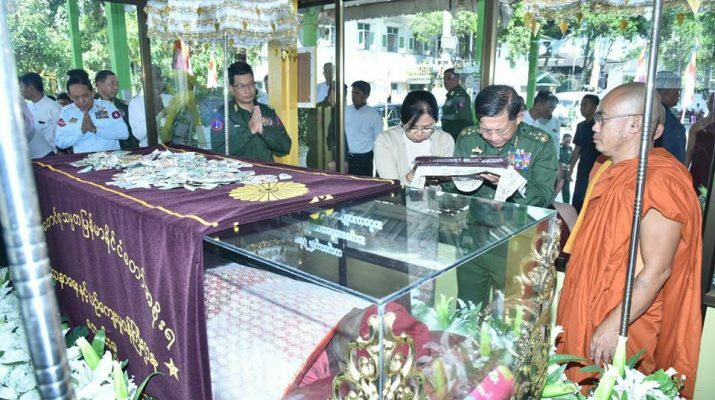 Commander-in-Chief of Defence Services Senior General Min Aung Hlaing, accompanied by wife Daw Kyu Kyu Hla, Commander-in-Chief (Air) General Khin Aung Myint, senior military officers of the Office of the Commander-in-Chief (Army) and Northern Command Commander Maj-Gen Nyi Nyi Swe, visited the temporary chamber of Dhamma Yatkhita Wuntho Monastery in Myitkyina where the remains of Monastery Presiding Nayaka State Ovadacariya Abhidhaja Maha Rattha Guru Abhidhaja Agga Maha Saddham-ma Jotikadhaja Agga Maha Pandita Agga Maha Saddhamma Jotikadhaja Bhaddanta Silavamsa Mahathera, who passed away on 18 June, are kept this morning. 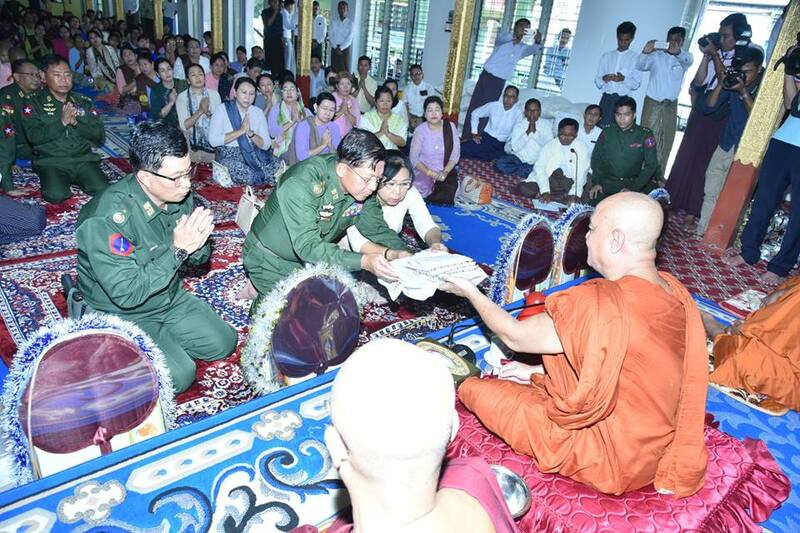 First, the Senor General and wife paid homage to the remains of the Sayadaw and offered robe. After paying homage to the statue and pictures of the Sayadaw, the Senior General laid a wreath and signed the visitors’ book. 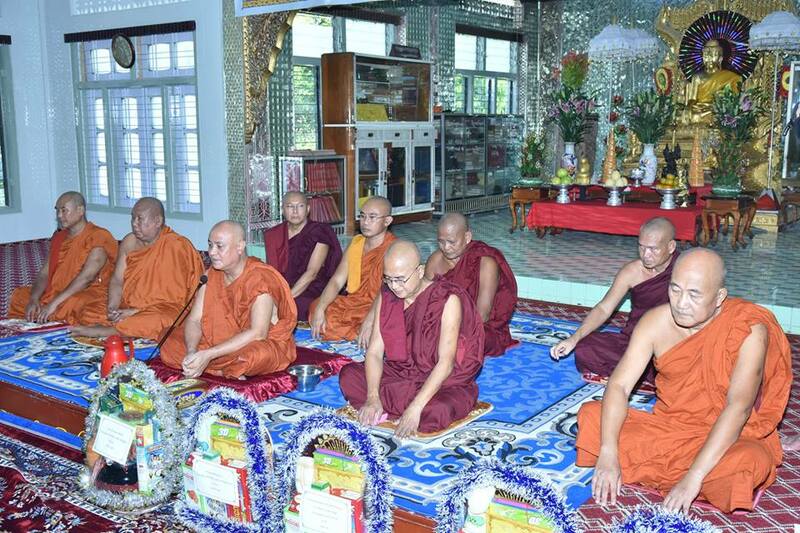 Next, the Senior General and party paid homage to Dhamma Yatkhita Wuntho Mona-stery Abbot Agga Maha Ganthavasaka Pandita Sasana Dhaja Dhammacariya Bhaddanta Ketumala and supplicated on matters related to the holding of the final rites. 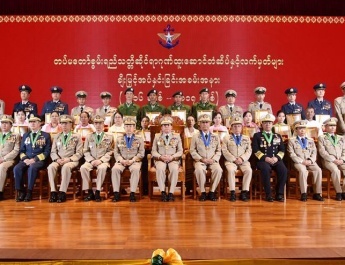 Then, the Senior General, wife and party received the Five Precepts from the Sayadaw. 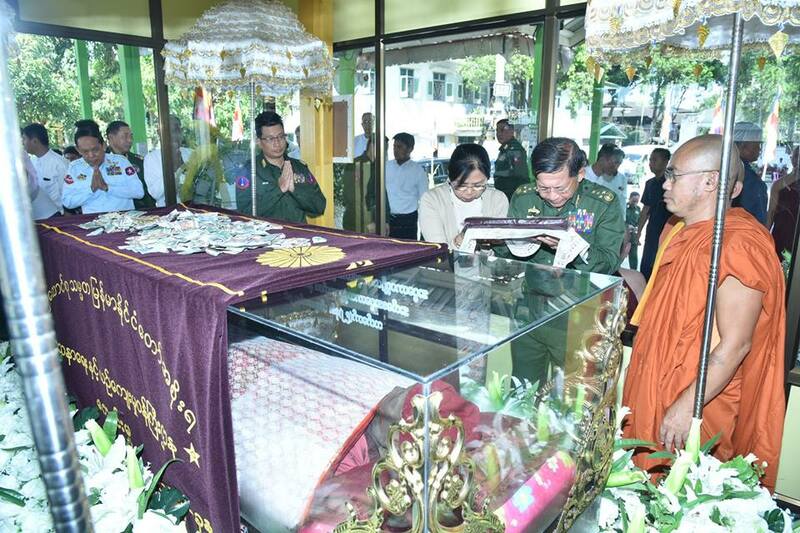 The Senior General and wife donated rice, cooking oil, salt and cash to the Sayadaw for the successful holding of the final rites. 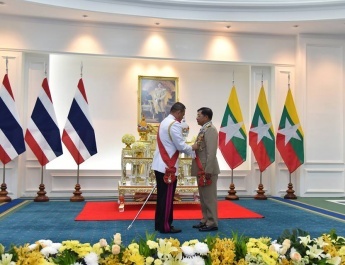 The Commander-in-Chief (Air) and the senior military officers also presented offertories to members of the Sangha sharing merits gained. 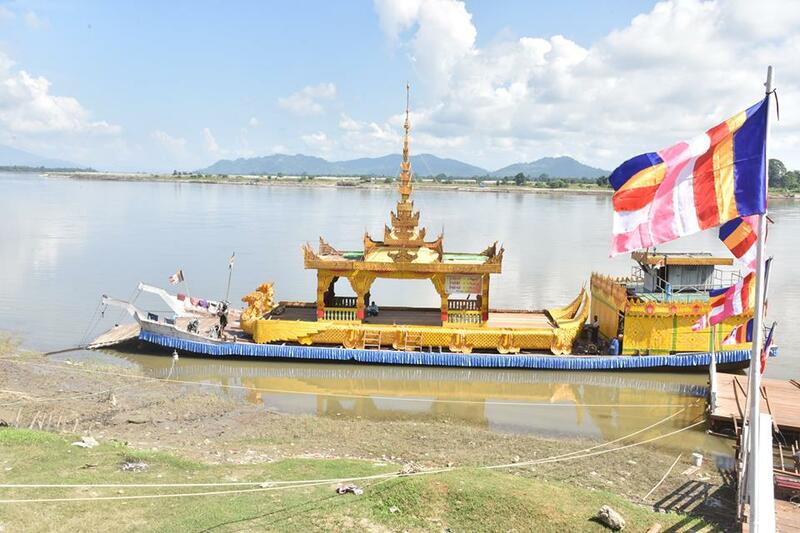 On arrival at the river bank from where the Sayadaw’s remains will be conveyed to Shwe Moe Taung, the Senior General and party heard a report by the commander on the conveyance of the remains by Karaweik decorated carriage. 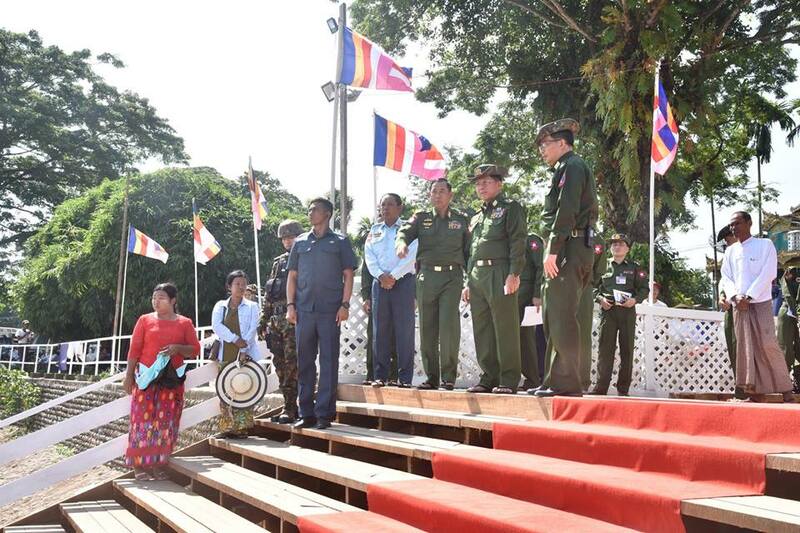 The Senior General and party proceeded to Shwe Moe Taung. At the briefing hall, the commander reported on progress in construction of the Sutaungpyae Pagoda where 1,000 arahants reside and holding of the final rites of the Sayadaw. In response, the Senior General gave instructions on construction of the pagoda with fine art and handicrafts in Myanmar style, laying of marbles on the pagoda platform and smooth flow of water and cooperative efforts for successful construction of the pagoda as the pagoda was first to be built under leadership of the Wuntho Sayadaw and more cash donations for the remaining tasks including offering of gold foils. 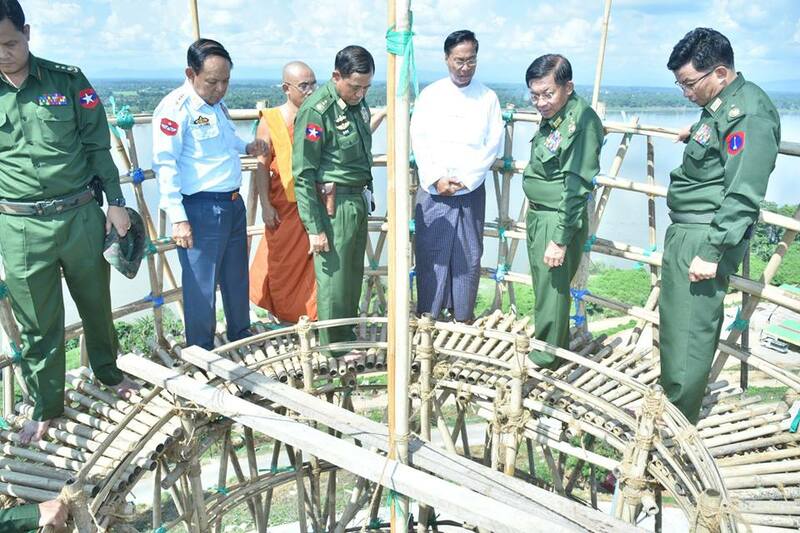 Afterwards, the Senior General viewed the pagoda construction and construction of a crematorium chamber for the remains of the Sayadaw. The Senior General and party paid homage to the Buddha image kept at the two-storey Soonsahsaung that can house 500 members of the Sangha or Yawgis. They then looked round the Soonsahsaung and kitchen. 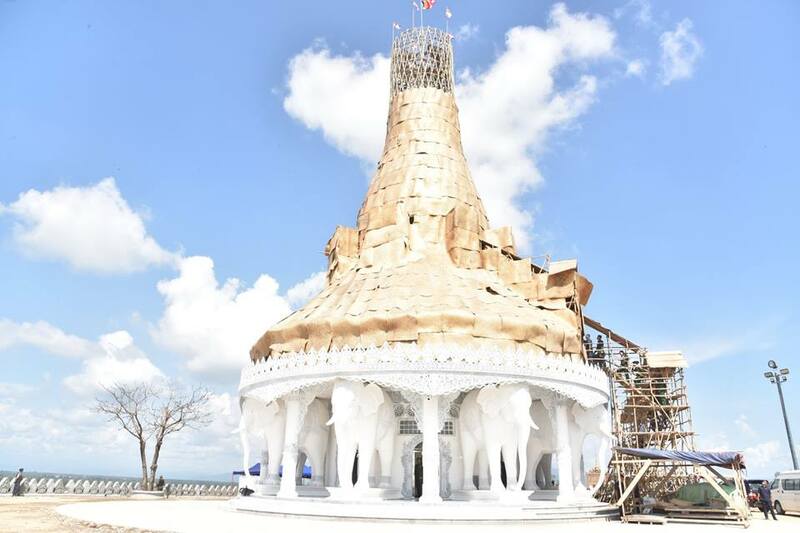 The Shwe Moe Taung Pagoda is built about one mile north of Bala Min Htin Bridge across the Ayeyawady River linking Myitkyina in Kachin State and Mongna Village in Waimaw Township. Under the pagoda are two Datpaungsu stupas and the statues of 1,000 arahants. The pagoda with 77 feet height has the Buddha images made of granite. The pagoda has been stuck with bronze foils donated by the families of Tatmadaw (Army, Navy and Air). Plans are underway to offer gold foils and 90 percent of the pagoda construction has been completed.